This morning depart from Strasbourg and head towards Colmar. 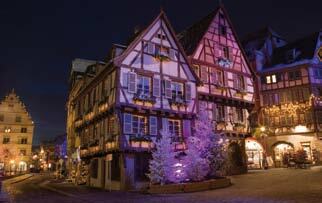 Christmas in Colmar’s Historical town center means a historic setting made magical by amazing Christmas illuminations that blend perfectly with the wonderful lighting designed to enhance the town’s heritage. The pedestrian city center with its major architectural treasures that stretch from the Middle Ages to the 19th century is decorated like in a dream, a veritable open-air theatre where the warm Christmas mood envelops the heart of the town. Here, enjoy some free time in the city to discover one or several Christmas Markets on your own, as the town holds 5 different markets. This full day tour will also include a wine tasting session in one of our carefully selected wineries so that you may have the opportunity, while in the region, to taste some of the most famous varietals this area produces. After the visits and wine tasting return to Strasbourg.